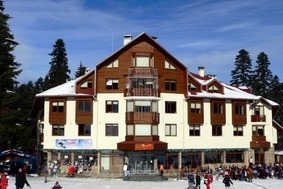 Ice Angels Hotel in the Bulgaria mountain ski resort Borovets (ski, Borovetz). Online booking discount !!! - 15 % discount until 30 September 2018! - 10 % discount until 20 November 2018! * Extras are combinable with early booking discount. Location: Ice Angels Hotel is a 4-star hotel in Borovets, situated in the centre of the resort opposite Rila hotel.